A Foreign Service Officer is hunted by an assassin after uncovering a nefarious plot. "With Jovovich fleeing from Brosnan's silver haired terminator there's no reason Survivor couldn't be a perfectly enjoyable chase thriller, but every aspect of the film suggests nobody involved cares about constructing a worthwhile movie." Ever since The Bourne Identity and 24 proved hits on screens silver and small, we've seen a seemingly endless stream of knockoffs in which protagonists find themselves on the run from shadowy government intelligence agencies, all the while attempting to avert some major threat to the security of the western world. Survivor (even the title is lazily conceived) is the latest, and one of the least inspired. Having lost friends in the attacks of September 11th, Foreign Service Officer Kate Abbott takes her job at the US embassy in London very personally, always vigilant about dodgy foreign types attempting to attain US visas for nefarious purposes. When her superior, Bill Talbot (Robert Forster), overrules her concerns over a suspicious visa applicant, Kate begins to snoop around and discovers Talbot has pulled this stunt several times with various members of his staff. The shadowy group working with Talbot decide Kate is a liability, hiring an assassin (Pierce Brosnan), known only as The Watchmaker to dispatch her. 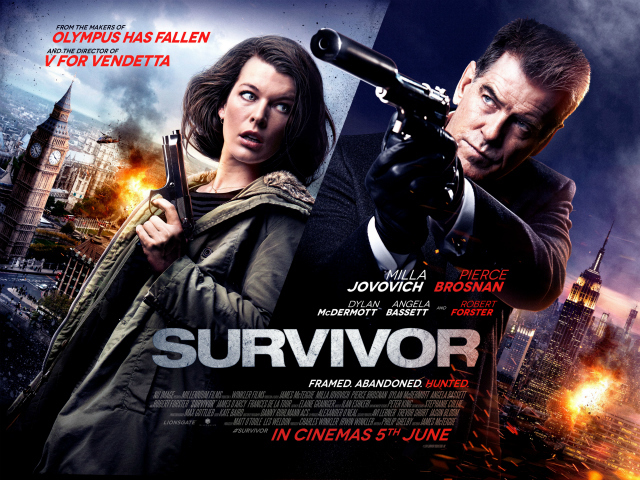 The basic premise is there alright; with Jovovich fleeing from Brosnan's silver haired terminator there's no reason Survivor couldn't be a perfectly enjoyable chase thriller, but every aspect of the film suggests nobody involved cares about constructing a worthwhile movie. The set-pieces are all too clearly derivative, none more so than a sequence in a London train station that's shame-facedly borrowed from The Bourne Ultimatum. But here we get sub-TV filmmaking, with director James McTeigue failing to generate any tension, suspense or excitement through his uninspired directing choices. Filmed in London, much of it appears as though a filming permit was denied, with most street scenes shot with a long lens, presumably to save on the cost of blocking off a street. The use of London, a city with one surveillance camera for every five of its citizens, makes the plot particularly implausible. Is there a more difficult city in the world to hide from the authorities? Yet the forces hunting Kate - US and British intelligence, along with the generic Johnny Foreigner bad guys - seem unaware of London's vast CCTV network. The film itself seems blissfully unaware of timezones, with characters making transatlantic flights as though they were short taxi rides, and it oddly always appears to be the same time of day in both London and New York. If the movie has a saving grace (it doesn't! ), it's Brosnan, surprisingly convincing as a quietly violent psychopath. His assassin has a strange habit though of killing anyone he works for, which makes you wonder how he manages to keep getting work. A similar question could be asked of director McTeigue.